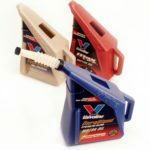 Blow Molding Design Guide – Custom-Pak, Inc. 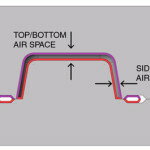 The Custom-Pak blow molding design guide provides you with basic design tools for making engineered blow molded parts. This guide focuses on the extrusion blow molding process. No two designs are alike, so the mold and process must be adjusted to optimize each design. Software products can help predict molding characteristics and our engineers are here to help make your product great. Our design assistance is confidential and free. Blow molding is a simple five-step sequence. 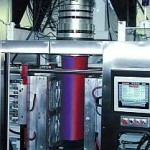 The first step involves mixing, melting and pushing plastic (extrusion) to form it into a tube called a parison that will be used to make the part. A mold is used to make the part shape you desire. The mold has two halves that are closed around the molten parison. Air is blown into the inside of the parison to expand the molten plastic against the mold surface. The mold is cooled to set the plastic to the new shape of the mold. Some of the least expensive materials are also the easiest to process. 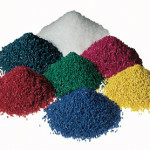 Polyethylene (PE) and polypropylene (PP) are the most popular blow molding resins. PE is currently less expensive but PP tends to be stiffer which sometimes offsets the cost difference. These materials are resistant to most chemicals. One difference is temperature performance with PE performing better at -75 to +160 degrees F and PP performing well from -0 to +170 degrees F. These materials usually form parts matching the principles discussed in this design guide. Many engineering-grade resins can be blow molded. Some of the acronyms include PPO, PC, PETG, ABS, TPE – you get the idea. 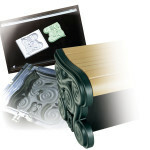 These resins require special consideration prior to molding. Most require drying before processing, specially designed extruder screws and specific processing conditions. The design criteria in this guide may not apply to parts molded from some engineering resins. Please obtain the correct design information for your specific project directly from our engineering personnel. In order to design a blow molded product, you must understand the interaction between the molten plastic parison and the mold. If you’ve blown a bubble from bubble gum you can understand blow molding. The plastic material stretches like the gum and if it gets too thin it ruptures. Since the parison is extruded as a tube, it is easy to make a tube or bottle shaped part, not much stretching occurs. The two mold halves open, the parison is inserted,the mold halves close and the part is blown. The split between mold halves is known as the parting line. There is often a knife like edge on the parting line around the part shape known as pinch-off. parison tube must be flattened to make the panel. When this happens the circumference of the parison becomes the surface that needs to cover the width of the panel. So we try to have a large enough parison diameter that as it flattens, it can be captured by the entire perimeter of the panel at the pinch-off. If the parison does not extend to all areas of the pinch-off, it must stretch the rest of the way. The soft plastic can stretch only a short distance before it begins thinning. Like the bubble gum, the first thin spot is weakest and it gets thinner fastest until it pops. If the plastic parison pops it is called a “blow-out” and results in no part formation at all. 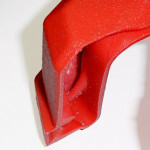 As the complexity of the part progresses to double-wall shapes with side walls and inner contours, the parison must not only be captured at all points along the parting line, but it must also meet the material thickness needs for the variety of molding conditions specific to each area of the part. Many of the design criteria used to make a tray with molded inner shapes will be the same for designing a complex industrial part. The inner and outer walls of the part are formed simultaneously and integrally, but interior and exterior designs are essentially independent so we review them separately. As the design develops, the designer should begin thinking about the interaction of the plastic and the mold that will produce the part. The visual exterior of many products is formed in one half of the mold called a cavity. Following are some of the features of mold cavities the designer will want to consider. A bottle is a typical example of a blow molded part formed using 2 cavity mold halves. A round bottle has a blow ratio that is comprised of a width=diameter and a depth=radius (2:1). The result is excellent material distribution in a round bottle. But, not all parts will be round. As designers start to push the limits of draw down into cavities, how far should they go? The answer depends on the elongation elasticity of the material and how thin a wall you are willing to accept. 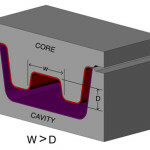 But as a rule of thumb, the material won’t stretch much further down into a cavity (Depth=D) than than the width of material available to fit into the cavity (Width=W). 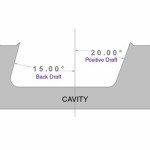 So, try not to design your cavity-cavity part to be deeper than the width. Many industrial parts are formed using a combination of cavity and core mold elements where the core forms interior shapes. The core changes the blow ratio parameters. The diameter of the cylindrical parison that forms a double wall part must allow enough material to enter the mold to adequately form each half of the part. Half of the cylindrical parison is used to form the exterior half (cavity) of the part and the other half of the cylindrical parison forms the interior half (core) of the part. 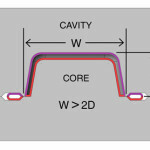 Since there is no flow of material along the mold walls (only stretching), it follows that the depth of the cavity (D) should be no more than one-half the length or width of the cavity(W). 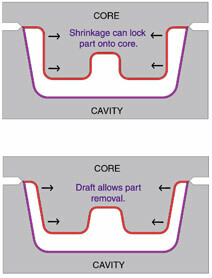 A part design utilizing cavity depths that exceed this relationship will be subject to severe thinning or blow-out. So like the relationship between diameter and radius, cavity-core parts should have overall blow ratios of W>2D. 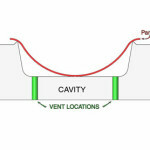 With multiple or divided cavities each cavity should meet this W>2D requirement. The design of certain complex parts will require changes in the parting-line location in order to stay within this relationship. These steps in the parting line must include clearance for repeated opening and closing of the mold halves and be positioned so they do not shear the parison during mold-close. A parting line angle of 10° draft or greater is generally designed into mold parting line steps. 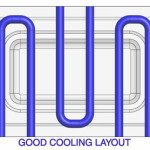 When 10° draft is not possible, options like angling the mold in the machine so that the parting lines form a positive draft relative to one another or moving mold sections can be used. The plastic parison sticks and begins to solidify as soon as it hits the mold. The material then stretches to fill the cavity as blowing progresses. There is no flow of material along the mold walls. There are three aspects of thinning to consider. The thinning caused by stretching results in weakness. Any thin, weak location is susceptible to further thinning because it has become thin & weak. The thinning progresses rapidly in these locations. The apparent rigidity (or strength) of any area on the part varies proportionately with the square of the wall thickness. Variation in wall thickness can result in warpage. The thinning along sidewalls and in corners is the reason that parts should have outside draft angles. Exterior draft is not critical to part removal from cavities since the plastic shrinks away from the outer mold walls as it cools. Draft is recommended when exterior walls are to be textured. the condition but not eliminate it. Because of this, cavity design must avoid features that contribute to thinning. 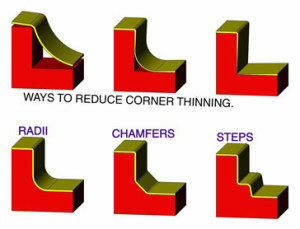 Designs that utilize sharp 90° corners will result in parts with extremely thin, weak corners. There are a variety of corner configurations that improve or alleviate this problem. The most common approach is angling the sidewall and putting a radius or an chamfer-angle at the corner. Part removal may be a problem with back-draft sections. Back-drafted areas can lock the part in the mold. If possible, a part with back draft on one side should have an equal positive draft on the opposite side. Thus, a part with a 15° back draft on one side and a 15° positive draft on the other side can be removed like a part with no draft. Otherwise, molds may need moving sections to remove the back drafted feature. Shrinkage varies by material, the rate of temperature change and the thickness of the material. For PP and PE materials, the material thickness is the best predictor. Thin wall parts may shrink as little as 1% and thick parts in excess of 10%. A .060” thick part will shrink approximately 1.65% as it cools and a .125” thick part will shrink about 1.85%. 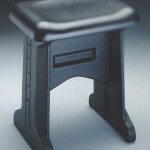 The shrinkage expectation must be taken into consideration when setting the mold size. Designs that allow wall thinning variation to occur in the part may result in warped parts. The thin areas will shrink less before cooling than the thick areas. The variation in shrinkage rates and distances can cause the part to warp. Some wall thickness & shrinkage variation occurs in every molded product because the cooling rate of the plastic will vary. The skin of the material against the mold metal will cool and take a set before the material not actually touching the mold metal. The result is a tendency for outer walls to warp inward and is offset by the tendency of the inner wall to warp outward. The use of structural ribs, welds between walls, arcs or steps can create a structure that helps reduce warpage. 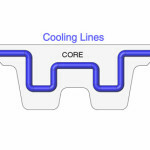 To control dimensions, surface appearance and warpage, it is important to have as much control over the cooling of the part as possible. Flow rate is a major factor in heat removal and cycle time. By creating turbulent flow, heat extraction and cycle times can be improved. To control warpage in many designs, it is essential that the mold cooling be targeted to provide extra heat extraction in the heavier wall portions of the part. The overall flow pattern also affects the part quality. Water warms as it flows through the mold. 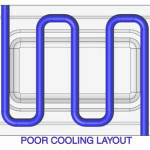 The mold should contain several inlets and outlets in an oscillating cooling pattern. A cold mold surface can also cause problems in reproducing surface details such as texture. Tooling engineers can target water lines near each critical section of the mold to provide the dimensional control and appearance you need. expand the parison, the trapped air becomes compressed by the expanding parison until an interior – exterior pressure equilibrium is reached. When this occurs, the parison will not completely touch the mold wall. The results are visible surface abnormalities, loss of texture & engraving detail, the appearance of creases and drag-lines, and longer cycles from poor mold cooling. 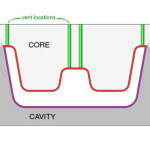 Venting can be easily located at the edge of any insert in the cavity. Slotted vent inserts or porous metals can be purchased and fit into nearly any location. Some venting methods will produce visible markings on the finished part. Texture, inserts and other techniques can be employed to mask the markings made at the vent location. The interior surface of double-wall blow molded parts is normally formed by a mold core. Since the mold core must fit inside the cavity, there should be no question it meets the same W>2D overall size requirement as the cavity. The half of the parison that is draping over the mold core is already beginning to set as the air is injected into the parison. As in the cavity, the plastic begins to stretch to fit the mold contour. Almost no flow occurs. Unlike the cavity, some different rules apply. As the mold halves close on the parison, the core presses against the parison and forces it into the cavity until the pinch-off is sealed around the perimeter of the part. The highest point on the core forms the deepest depression inside the part. If the double-wall part design has a dividing wall between two compartments, this wall is formed by stretching the plastic into a groove in the mold core. As the plastic begins stretching into a groove, it begins to thin. If the groove is too deep, the plastic quickly reaches the point where it thins until the internal air blows-out through the wall to the outside of the part. No part will form. Because of this, there is one simple yet absolute rule, which governs the design of the ribs or divisions between compartments. The depth (D) of the groove between core sections must not exceed the width (W) of the rib W>D. This rule also applies to other structural shapes. For example, a 1” tall, round post in the center of a tray would have to be 1” or more in diameter. 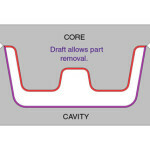 If the part design requires a mold parting line which steps to various levels for the part to function properly, then the core must have a positive draft on these steps at the pinch-off to match the pinch-off on the cavity element of tooling. Varying pinch-off levels can change the W-D relationships of nearby pockets or ribs. All of the levels within a part must pass the W>D requirement in each direction. When the mold closes, half of the parison is draped over the mold core to form the interior of the part. As the plastic cools, it shrinks onto the metal mass of the mold core. Positive draft is needed on all sides of the mold core in order to remove the plastic part after it has shrunk. The more generous the draft, the easier the part can be removed from the mold. A part with 5° positive draft on all sides of the core can be removed with the assistance of ejector pins. Parts with lesser draft can also be removed with ejector pin assistance but as draft on the core decreases, the risk of damaging the part during ejection increases. 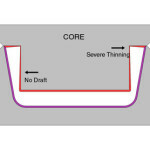 If a core design requires a no-draft or back-draft section, a positive draft should be provided on the opposite side of the core, if possible. Snap-fits and small undercuts can be fine-tuned to allow ejection. Overall the shrinkage of the interior will match the shrinkage of the exterior. But, the shrinkage of an interior shape is restricted by the metal core used to form the shape. Minor mold size adjustments may be needed to meet specific dimensions. extraction can be critical to the success of the part. Any location where air can be trapped between the parison and the mold wall is a location for a vent. Deep cores can trap large volumes of air and the blowing speed can require larger venting capacity for the trapped air to escape. If there is doubt, it is better to include a vent than to discover the problem at production. It is the combination of closing the mold on the parison and the expansion of air inside the parison that forms the part. The designer must leave sufficient space between the inner and outer part surfaces to permit adequate blowing of air into every square inch of the part. If the air passage inside the part is reduced or obstructed, the part will not form. There are no clear-cut rules regarding the amount of air space needed between inner and outer walls to form a part. Smaller and lighter gauge parts seem to require less air space than large and heavy-gauge parts. Sidewalls typically require slightly more air space than bottom or top surfaces. Rule-of-thumb minimums for air space in parts up to 1 sq.ft. would be 3/8” on sidewalls and 3/16” on top or bottom surfaces. Parts larger than 1 sq.ft. should form adequately with 5/8” air space between sidewalls and 5/16” on top and bottom surfaces. The more air space you can allow, the better the part will form. It is also interesting to note that thin panels can become stronger by increasing the distance between walls. There is a molding phenomenon called webbing that can occur when the mold closes. 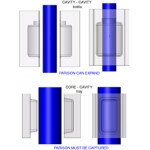 As the core and cavity mold pieces close onto the parison, the parison is rapidly transformed from a tube or bag shape into a functional configuration. As the core is pushing the parison into the cavity it is possible for the opposite sides of the parison to touch before the air is injected to form the part. When this happens, the plastic welds together inside the parison and when the parison is inflated, the weld resists separation. The result is either a part with a very thin, weak section all around the welded web or, if the nearby material tears when the parison is inflated, it blows out and no part forms. Webbing is more pronounced in deep cavities with corresponding deep cores. However, certain configurations can make the parison collapse or fold back on itself to cause webbing when the mold closes. It is a good idea to ask for a simulation test on deep parts that might produce webbing. 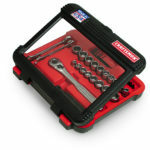 Many functional designs are greatly enhanced by the inclusion of compression-molded tabs, locks or mounting surfaces. Compression molded tabs can be added at any point along the mold parting line on the same plane as the pinch-off. To change the angle of a tab relative to the basic parting plane, you must create a mold parting line at the desired angle. This can be done with angled parting line steps or inserts along the perimeter of the part or moving inserts within the part. When blow molded parts are to be combined with other parts through the use of mounting screws, bolts or rivets, an exceptionally strong mounting surface can be provided by compressing the inner and outer walls together. The two walls can be compressed together at nearly any angle or location as long as there is ample room surrounding the compression for good airflow and as long as the mold halves can close without interference. The double walls in blow molded parts provide engineers with a tremendous opportunity to create structure within the plastic part. 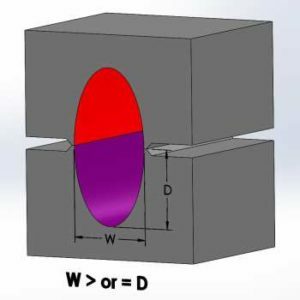 A properly designed double-wall part will be substantially stronger than a ribbed single-wall part of equal weight and can easily outperform metals in many applications. 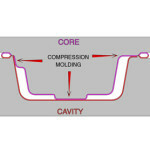 There are several ways to add strength to blow molded part designs. By designing the mold to close in specific locations to a distance that is less than the combined thickness of inner and outer walls, a weld is formed. The amount of compression sets the strength of the weld. By adjusting the distance between mold halves to between 60% and 80% of the combined thickness of inner and outer walls, the weld can resist both compression and separation forces. The location of welds within a part will determine the stiffness and ability to support loads. Designers must remember to pay attention to blow ratios between welds. Ribs are very effective at adding strength to parts. Ribs can be designed to support expected forces in nearly any direction. Sidewalls can be ribbed to add stacking strength. Panels can be ribbed to improve stiffness and control sag. For best results, ribs should weld inner and outer walls together in controlled intervals. The rib location and length must also be such that a hinging action won’t develop when loads are applied. By alternating rib directions in non-uniform patterns, ribs create excellent stiffness and the ability to support loads. By combining curvature with ribs and weld cones, lightweight plastic parts can become stronger than steel. Circles and arches create some of the strongest structures on earth. Custom-Pak engineers can help with design evaluation and testing so you can be sure you will achieve the results you are seeking. There are a limitless number of secondary operations that can be performed on a blow molded part to meet the needs of the finished product. Drilling, sawing, milling, cnc routing, die cutting, punching, riveting, screwing, sonic, spin or heat welding, and surface treating are common operations. Nearly any secondary step can be performed economically if the right equipment is available. A surprising number of operations can be done in-mold. Custom-Pak provides a huge variety of secondary operations equipment at no charge. stamp decorating, the part design must provide a means to support the tonnage of the stamping process. For in-mold labels, magazines to hold the labels and mold surface locators must be prepared. 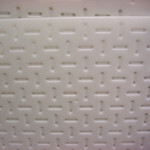 For embossed plaques, the attachment method should be included in the part design. Texture is commonly applied to mold surfaces. Blow molding textures are typically etched .008” to .012” deep in the mold surface (much deeper than injection molding). Draft may be needed to allow the texture to form and still release from the mold. 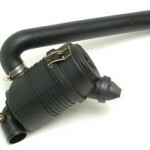 There are many ways to get the appearance that you want in your blow molded parts. We can help you make sure your design will look great long after the consumer has made their purchase.